On May 3, 1978, the ABC Evening News anchor Harry Reasoner announced Bill Downs' death from cancer at the age of 63. After a nearly two year retirement, Bill Downs joined ABC News to cover the immediate aftermath of the assassination of President John F. Kennedy. These are portions of ABC's coverage of the assassination, including some reports by Downs. An expert reveals what our Army, Navy and Air Force have learned in their bitter struggle. This costly knowledge can save our country and the world. CBS correspondent Bill Downs talked to GIs, flyers, Marines in Korea, to generals and admirals there and in Washington for this article. "It breaks your heart," the young second lieutenant was saying. "Those kids don't even know how to dig." It was in the early days of the Korean war. The lieutenant was returning to his unit. He had been wounded two weeks before and was still pale and limping, but determined to leave the Pusan hospital to get back to his men. "I tried to teach them," he continued, "and after we took some casualties, they learned fast enough." He shook his head and again said, "But we lost a lot of boys because they didn't know how to dig." The young Navy rating had come topside for a breath of fresh air. "What do you mean, 'the great United States Navy?'" He spat over the rail. "Do you realize that when this mess in Korea started, the United States Army was actually sailing more ships than the Navy?" And still later, the ancient 28-year-old jet pilot, just rotated from the battles over the Yalu River, toyed with his drink in a Washington tavern. "This isn't loose talk," he declared. "You'd find it out in any read room on the spot." He gripped the glass and set it on the table for emphasis. "If we were flying those MIG-15s, we would have aces over there with 40 aircraft to their credit. We would clean out that Communist 1,000-plane air force in combat in six months." Korea has been a gigantic military proving ground that revealed in bloody detail the mistakes and inadequacies of the United States armed forces. The cost has been high—more than a hundred thousand casualties. Those casualties will have been in vain if US military leaders—and the American people themselves—do not learn the lessons of this war. When the Korean conflict first broke out, it became apparent how tragically weak the United States has become in five years of uneasy peace. American military planning, understandable perhaps, was directed at the defense of this country in event of a third global war. The possibilities of the atomic weapon and its delivery to any spot on the earth's surface occupied most of the attention of the policy-makers. The US Army was not a combat force. Particularly in Japan it was more of a gigantic social club, broken into unmilitary units for the necessary occupation duty softened by the easy life of a conqueror. General Walton Walker, later to die in Korea while commanding the Eighth Army, had recognized the dangerous situation created by the state of the troops and command of our forces in Japan and only some three months before had started to reorganize the scattered occupation units into a fighting force. He also had ordered toughening maneuvers. But the job was barely under way when the Communists crossed the 38th Parallel. Lessons came quickly in Korea. The American fighting man is the most mobile soldier in the world. He has more wheels per unit than any other Army. But in the precipitous valleys and bad roads of Korea, wheels are not much good near the front. In the early days, it was the enemy who had the mobility, simply because he could climb the mountains. The American soldier had to learn how to walk again, a fact giving rise to the criticism that "they have the best shoes and the worst feet in the world." And when winter came and the shoe-pac shortage developed, they no longer even had the best shoes. On the other hand, the value of the new recoil-less weapons was proved to him—particularly the 3.5-inch bazooka with its shaped charge which proved so effective against enemy tanks. The shortcomings of the Army often are more obvious than deficiencies in the other services. But the Air Force had parallel faults. The morale of the pilots in the early days of the fighting was complicated by the fact that many of them could breakfast at home, fly their missions to the battlefront and then return home to their families. And only recently has the most glaring weakness of the Air Force been revealed: the fact that the Russian-built MIG-15 swept-wing jet fighter is a superior flying weapon to our F-86 Sabre Jet. The MIG engine weighs less and is more efficient. The plane itself is lighter and stripped of safety gadgets which American planes carry—gadgets which have value for flying in the United States but which are useless over North Korea. And the MIG-15 can outperform the Sabre in every department at altitudes over 12 thousand feet. Most jet fighting is done between 25 and 35 thousand feet. Although it is not the intention here to go into the "Great MacArthur Debate," one of the reasons that the Air Force command concurred in the decision not to attack Manchuria was that the aircraft industry in this country was in critical condition. The major strategic bombing plane on hand at the time was the obsolescent B-29, then in process of being replaced by the B-50 and other models. Had the decision been made to bomb Manchuria, an admittedly costly venture, there would have been no new B-29s to replace those in Japan and Okinawa when they were lost. The lesson here is easy: the nation let its aircraft industry lapse into dangerous inactivity. It takes four to seven years to develop a fighter plane and longer than that to develop a bomber. Such limitation of action in a larger conflict could prove to be a national disaster. But the most valuable lesson to come out of Korea was that all the atom bombs, jet aircraft and battleships in the world cannot replace the infantryman—the man with the gun who moves in and occupies real estate. The lesson has been learned in Korea. The question is, has it been learned at home? In Congress? First they called the enemy "Gooks." Marines and soldiers soon learned that the derisive term "gook" did not adequately describe the well-organized army of the North Koreans which poured south to the perimeter. For the Korean war gave the United States and her United Nations allies the first measure of the new Red military power in the Far East. The lesson has been a valuable one. Although the Air Force maintains complete mastery of the air over the battlefront, the enemy has also proved that no amount of aerial attack can completely halt a determined force from advancing. Even though enemy supply lines are blasted continuously, a walking army can live off the land and walk its supplies to the front under cover of darkness. The enemy also proved that new and complicated weapons often are less effective than older, simpler ones. The Communists' most effective weapon was the simple Russian copy of the old Thompson sub-machine gun—the kind that became famous in the Stalingrad fighting. Crude by American standards, it is easy to handle and seldom jams. One infantry officer said, "It can probably fire under water." The finely tooled American carbines easily jammed with Korean dirt. And a more subtle lesson also was learned from the Communist—that a man's race has nothing to do with his ability to fight. In this connection, Korea proved that a non-segregated American army is as effective as any that has fought in any war under the Stars and Stripes. The Communists taught the Air Force that even on so primitive a battlefield as Korea, they are capable of accurate and efficient use of antiaircraft weapons—and they have good ones. And in the most recent fighting, it is obvious that the Communists have powerful radar equipment which can pick up and count the number of planes which take off from Seoul's Kimpo Airport, and relay the information to the MIG fighter bases across the Yalu. That is the reason there is seldom surprise on our fighter sweeps in North Korea and why the Sabre jets almost always are outnumbered by two to one or more when they arrive at their destination. In short, Communist power in the Far East is not only grounded in overwhelming masses of men, but also in the modern scientific equipment, such as electronically laid antiaircraft fire, excellent communications and extremely efficient radar operation. The United Nations air forces have maintained their edge over the Communist air force—even though outnumbered—simply because our pilots are better trained and their combat techniques far superior to anything the Communists have to offer. But as the aerial fighting progresses, the enemy too is becoming better trained. As one pilot put it, "We feel as if we're running a combat school for the Communists when we go up there." But the most sobering lesson we have learned from the enemy in Korea is that the Soviet Union as of this moment appears to have opened a technological gap that will take the United States time to close and surpass. At present, the US Air Force has kept that gap closed through tactics and training in its pilots. They cannot keep it closed forever. 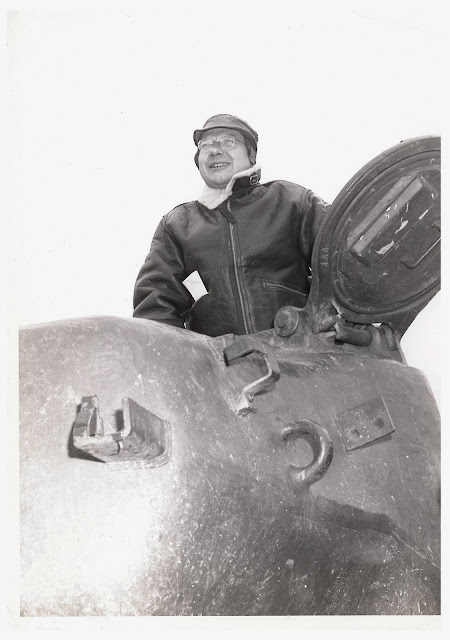 Colonel Mike Michaelis, one of the outstanding field commanders in Korea, was raked over the coals at one time when he declared in effect that "we spend so much time teaching the GI what he's fighting for that often he's not taught how to fight." For the Army, the lesson most quickly learned was that American training methods had to be tightened up. General Matthew Ridgway, when he took command of the Eighth Army, messaged the Pentagon that he wanted no soldiers who could not climb a Korean mountain as fast as any native and still be able to fight when they got to the top. The Marines proved the value of tough training. It is now under way wherever American troops are stationed around the world. The Korean war also underlined the lesson that American military power hits hardest when all branches combine to deliver the blow. The result has been that never before has there been seen such cooperation between the ground, air and sea forces as has been developed on that embattled peninsula. Close-support strafing and bombing were developed in the last war—but the "cab rank" attack, wherein spotter planes and ground observers are able to call in planes from an aerial attack above them, never before was practiced with such efficiency. The Navy's bombardment of enemy front-line positions along both coasts, on order from the Army, was never so extensive. And the Naval air arm for the first time used jet planes off carriers in combat operations. The Navy's blockade of the Korean coast has been complete. Naval gunfire has interdicted the road and rail center of the east coastal town of Wonsan for more than a year. And of longer-range importance, the Navy has been able to refine and develop its mobile supply system, making it for more rapid movement of supplies and rendering our Pacific fleet completely self-sustaining. This is of paramount importance in case a major blockade of the Asian coast becomes necessary. But perhaps the most important development—both for the Air Forces and the infantry—is the development in Korea of new uses for the long-ignored helicopter. Its use in rescuing men from behind enemy lines and from the sea has been unprecedented. As a flying ambulance, it has saved countless lives by quick ferrying of casualties to the rear. And finally it became a combat aircraft, carrying Marines behind the enemy to capture a mountain peak without having to climb the mountain. The Korean war has been fought without two of America's most popular weapons—all-out strategic attack from the air, and the atomic bomb. There were valid reasons for withholding both. It was decided that extension of the bombing program into Manchuria would risk a third world war while the nation was unprepared to fight one and while the critical condition of the US aircraft industry could not replenish losses incurred in such a bombing program. Regarding the atomic bomb, the sparsely settled and mountainous terrain of Korea simply offers no targets worthy of this weapon. Although tactical atomic weapons are now in development, to use such weapons in Korea would supply the enemy and his allies with valuable intelligence of our progress. Also it is felt that we do not presently have enough fissionable materials stockpiled to waste any. And finally, the reaction of the Oriental peoples throughout the Far East was a factor in withholding the atomic bomb. It was feared that such mass destruction might alienate those whom we someday hope to draw out of the Communist camp. The Korean war, which started out with the unfortunate name of a "United Nations police action," has developed into what history may record as a most fortunate trumpet call of alarm for the free nations of the world. History may also record that Josef Stalin made Communism's biggest mistake when he ordered the North Koreans across the 38th Parallel in June, 1950. For the Korean war aroused the most powerful nation in the world to a sense of its own weakness. 1. Our policy-makers concentrated too heavily on global defense and the atomic bomb. 2. Our infantrymen had forgotten how to walk and lacked tough combat training. 3. Some of the Army's finely tooled weapons were too specialized for all-purpose fighting. 4. Our pilots flew into action in planes designed more for training safety than combat performance. 5. Our aircraft industry had fallen behind Russian aviation in the output of highly maneuverable jet fighters. 6. We made the classic military error of underestimating the enemy. But over and above these lessons, the Korean war taught that in this modern world, peace is only preservable through strength, and that if we value freedom, justice and the dignity of the individual, we must be willing and able to defend them. The men who have suffered and died in Korea will not have given their lives uselessly if we remember what it has cost so much to learn. These photographs feature Bill Downs at various points in his career at CBS, as well as memorabilia from his time in Europe during World War II. 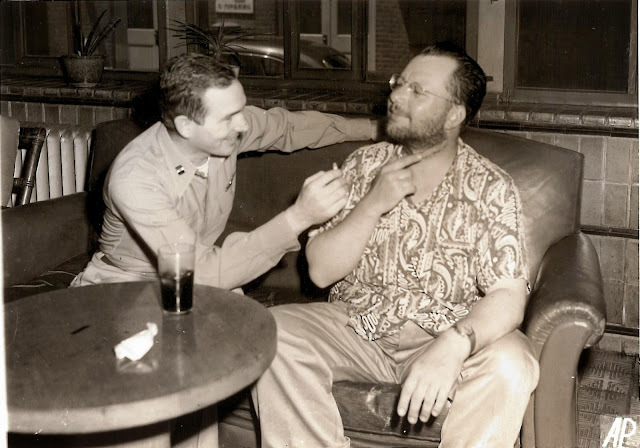 From Christmas 1942 to January 1944 Downs was CBS' Moscow correspondent. From 1953 to 1956 he worked as CBS' Rome correspondent, where he covered Italy and the Middle Eastern affairs. He was in a press interview with President Gamal Abdel Nasser in early November 1954, shown below. (From Cloud & Olson) "D-Day team gathers together on a London sidewalk. 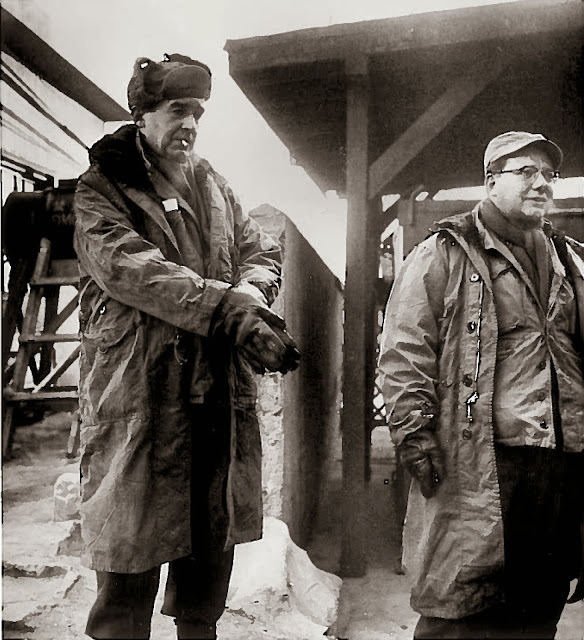 Left to right: Richard Hottelet, Gene Ryder, Bill Downs, Charles Collingwood, and Charles Shaw"
Bill Downs and Edward R. Murrow were among the many war correspondents who covered the Korean War. Below are some abridged letters sent home from Downs to his wife. He writes of his experiences with fellow correspondents, military censorship, and life in Korea. I’ve got a few minutes to write…this area is a shambles, no communications, conflicting reports of what’s going on. Even in Tokyo we have to start from scratch since some genius closed us up out here. In other words, all work and no fun. The trip to Korea was a nightmare. You have to clear all of MacArthur’s red tape first, then you catch a 3 AM plane, you go to an airfield six hours away in southern Japan, then the rain falls in torrents, then there is a report that your airfield has fallen (which is untrue), then finally you climb aboard a plane-load of bombs and they set you down at another airfield a hundred miles away from your destination. After reaching Taejon, the troubles just begin. No transportation. So you hitchhike to headquarters, check in, lug your baggage to the correspondents’ billets and pick a soft place on the floor. Then you start to hitchhike to the front with a GI driver who doesn't know where he’s going. Then you arrive at headquarters, get a briefing, go forward, get shot at and run like hell lugging your tape recorder behind you. After you get out, you find the batteries have failed. On the way back you hitch another ride. The driver loses his way and you end up in southern Korea almost to the coast. You backtrack and arrive about midnight on an 8 hour trip in a truck over the worst roads in the world. It should have taken an hour and a half. You scrounge a blanket, try to sleep on the floor but fleas and mosquitoes won’t let you. The next day you take your recordings and get the hell out. That’s about it. By the time you get this, I’ll be on another story which you will be reading about. Don't worry, it doesn't look too difficult. I missed Marguerite [Higgins] in Taejon, such was the confusion and the haste. Frank Noel is now coming over, which will break the boredom of this area. Marguerite, incidentally, has managed to make every correspondent over here despise her…but she doesn't appear to mind. [Bill] Costello is up to his ears in work and routine. Also Bill Nuckols and Alice just arrived in town yesterday…he’s on permanent assignment. Sends his regards. You’ll be happy to know that I’m on my fifth day of a beard. If it comes out all right, I might bring it home with me. Anyway, I’ll send you a picture of it if anything develops. It’s pretty horrible looking right now. I forgot to tell you that Bill Dunn also showed up working for NBC. He’s lost a lot of weight and feels fine. We hope to find time for a golf game one of these days. Only diversion so far was a Japanese meal of sliced pork, raw fish and sukiyaki---plus geisha girls to pour the sake (nothing else). We seem to work around the clock. The 8 AM shows for NY are broadcast here at 10 PM. We record for the 7:45 at 2 AM. [Eric] Sevareid show is at 1 PM. No one is getting much sleep…it’s ungodly hot and if you aren't wet with sweat you are wet with rain. In other words, stay away. As soon as we get lined out here and I can retreat, I’ll let you know about Hawaii. It can be arranged. I hope you found the house we want. I’ll be ready for something sensible to do after this debacle. But it looks like victory may be a long time in the making…if we ever achieve a complete victory here. I don’t know. Just a few lines before shoving off for a broadcast…it’s how, sweltering, sweat is dripping down my beard which is this (---) long. I look and feel like a character off skid row. As you know, Murrow arrived with your letter. Then another arrived, plus a dispatch from Bienstock which is called an “Absolute Assignment” giving you control of my insurance so that you can buy the house. You now have me in your power. I’m enclosing a letter from Leonard Miall in which you will be interested. Keep it and then next time you get a chance call him and see if everything is okay with the car. Sounds all right. Also enclosing a picture form the Nippon Times which does not do justice to my hirsute accomplishments. As you can see, laughing William Lawrence did not get married. Still has tears in his eyes and now trying to forget it all among the Korean Fleas. Finally I am getting W. Costello to the front for a look as well as Pepper Martin. We have been sitting with our thumbs you know where for the past week…but since this is a relay job, I said that I wouldn't go back until someone else took a crack at it. Murrow and I are going over towards the end of the week. Meanwhile I have been doing nothing but trying to get tape recorders to work. Turned engineer, I have. Murrow took one for the little darlings along on his operational flight…it came out sounding like the inside of a Mixmaster but he managed to salvage 30 seconds. I’m told that Jack Jefferson is coming over…which is good news and will put me into a position to disengage…a term I’m fond of. [Higgins is] going back to the front to get loused up again. I think she’s got a suicide complex. No kidding, she’s nuts…wants to call off the thing with Will Hall. And he’s breaking his neck to get over here. I suggest we keep out of it. The next letter is missing the second page. I’m just preparing to shove off for Korea for a week or so. It’s ungodly hot here and I sweat by the gallons…haven't lost much weight though. My beard is not very successful. After a few more days and some pictures, I’m shaving it off. Just thought you should see the experiment, that's all. As you know, Jack Jefferson is coming out here. Murrow is collaborating with me to get both of us back in September or thereabouts. The idea is that the experts figure the weight of the news will shift back to Europe in the fall (I'm doubtful of this). But nevertheless, my "disengaging" program from this part of the world is underway. The local picture on Korea is getting better, I believe…but the overall picture in the Far East is getting worse. The dilemma is that Russia can afford even less than we to take a defeat in Korea…and when and if we look like winning, then she will probably move somewhere else in this part of the world. I want to get back before this happens or I might be stuck here for months. On the other hand, there may be a move in Europe which will take interest away from here…then I can probably return to fill the resultant gaps in Washington. Murrow is out with the B-29s today. The more I see of the guy, the more respect I have for him. He turned down the VIP treatment to bunk in with the jammed up Press Club facilities. Saw John Osborne of Life last night. He’s going to Korea in a couple of days too. M. and I had dinner with Bill and Alice Nuckols the other night. She still looks like a potential president of the women’s auxiliary of AA. Sends her best. Moseley has managed to screw up a couple of things in San Francisco and Murrow is for sacking him. He failed to send the first broadcast out of Korea by Costello…said there was nothing new in the content. Also Murrow and I were talking about the “great return.” We discussed Honolulu…the possibility of meeting you and Janet there. But since that is the long way home by PanAm, we are in the process of concocting a scheme which sounds good at the moment. Downs and Murrow returned to Korea sporadically throughout the war. In a Christmas Eve, 1952 episode of See It Now entitled "Christmas in Korea," Murrow interviews American soldiers stationed on the peninsula. Downs makes a brief appearance. I spent a lot of time in Pusan, as you probably have gathered. The town has one paved street, some streetcars, a good port and that’s about it. Except millions of bugs and Koreans. The only thing that saved the day was a half-dozen bottles of Scotch I was farseeing enough to bring along. Slept on the floor most of the time, no baths…and people started to walk to the windward of me. Met the Marines and rode the rods on a flatcar with a tank to the front. Forgot about all the tunnels and when we arrived, I looked like the kind of the hobos. Spent a day at the front…most unpleasant and came home. I had a hunch about the offensive. Too damn many Koreans again. Their battle intelligence is terrific. We’re going to have one hell of a time before this is over…if ever it is. Murrow worked the north, I the south. Didn't see Boyle or Lawrence this trip. Probably see them next week. I've been thinking about doing an expense account…but find that it includes our arrival in Washington and have drawn a blank there. I’ll think of something. Bob Considine arrived the other day…he’ll be leaving soon…and I’ll have him give you a ring. Jack Jefferson is due here within the next few days. I don’t know how my disengagement plan is coming off…that’s the reason I asked you about it the other day. New York is being so fussy about the quality of recordings we have been doing by phone from Korea that everyone here is furious. For example, they refused to take a frontline piece by Murrow after the attack. I heard it played back from San Francisco, and while it was not studio quality, it was extremely dramatic and understandable. I raised hell saying they don’t fight wars in studios…but anyhow had to get up and 4 AM and do a digest for him. I took TV pictures like mad but don’t know whether they have been used or what. We have recorders over here galore…but most of them are out of whack. Just thought I would report to you that the situation is well in hand. Joe Alsop just showed up. He’s going to Korea, the best excuse yet I have to stay away from the place. As you have heard, Christopher Buckley was killed. I don’t know whether you met him or not, but he was one of my favorite Englishmen. We were on the Normandy show together. Everyone is depressed by the mounting casualty list and there are less and less chances being taken…except by Marguerite and Homer Bigart…one or the other is going to get it one of these days. Telling them doesn’t help. Murrow leaves on the 16th and is bearing gifts…as is Barney Oldfield, who left the day before yesterday with a birthday gift for you. I am sending along the Seven Happy Gods of the Orient—originally Chinese but adopted by the Japs. Now my problem is to identify them. When you get the happy seven, there may be no explanation but I’ll send it along later. Also sending a Kimono for Will. Would you like one? Okay, I’ll get it. The other news is that Chester told Murrow that he plans to replace me here about September 1. I don’t know who is coming out. We are thinking of hiring a man here. At any rate, the disengaging process is on. I hope they get the sewers in before I return. Your description of the house sounds wonderful. Only a couple of things I’d like to know further. Is it brick or what…does it have a basement…what kind of heating facilities? If you get a chance, take a picture of it and pass it along. I have to finish this so that Murrow can take it back with him. They moved his plane up a day. Apparently he’s got to go to Europe after this trip…I don’t envy him at all. 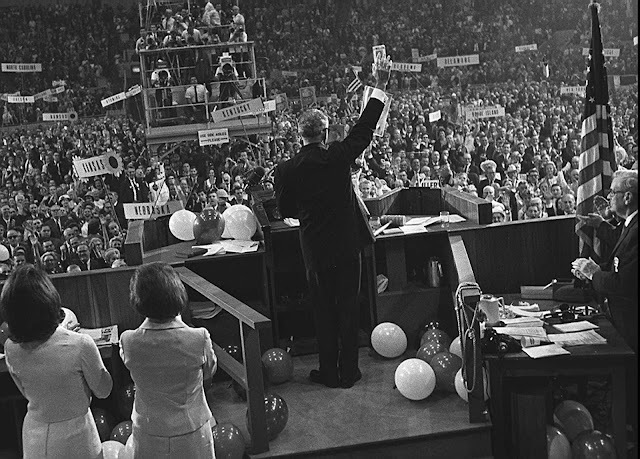 Republican Senator Barry Goldwater won his party's nomination at the 1964 National Convention in San Francisco. A conservative icon, Goldwater's rise marked the collapse of Nelson Rockefeller's liberal/moderate-type wing of the GOP, the Rockefeller Republicans, as the party shifted more to the right. "I would remind you that extremism in the defense of liberty is no vice. And let me remind you also that moderation in the pursuit of justice is no virtue," Goldwater said in his acceptance speech. ABC News sent Bill Downs to San Francisco to cover the convention. After the first day he wrote to his wife, Roz, giving his thoughts on the convention's proceedings and its participants. I trust you watched the mass suicide that occurred this night in San Fran. I would say the atmosphere reeked of the Brauhaus—and it was followed by the ridiculous, quixotically wonderful and completely futile and symbolic "lie-in" before an unused Cow Palace gate that I trust got the paper publicity. Funny thing about it, the Goldwater jungen and mädel were almost but not quite as disciplined as the civil rights demonstrators who were more effective than the police in keeping the scene outside the Cow Palace peaceful. Everyone had their orders except the Goldwater-packed galleries not to boo the opposition. Kind of an armistice until the non-violent rightists and passive resistant leftists decide it's time to really have a go at each other. I keep getting the feeling that they're keeping deep, dark secrets from us respectably naive middle class righteous old fuddies struggling with out-to-fashion moralities in search of outdated and inherited truths that no longer apply—at least to this smaller revolutionary convention. For example, I don't understand the handsome, clean-cut and muscular young men barely out of their teens who show polite contempt for the printed and broadcast media—all apparently convinced that reporters are ideological enemies or idiots bent on destroying the Goldwater icon…potential desecrators of the new republicanism. It's sad and frustrating and, as you said…more than frightening. I'm interested in getting your view from the tube. The concentration of black and white electrons must have made it worse. 1951. World War III in Asia? Will World War III Begin in Asia? WORLD WAR III IN ASIA? The first time I heard the question asked was in Pusan, that odoriferous, overcrowded United Nations base on the southeast tip of Korea. It was asked by a young second lieutenant who, last August, had talked his way out of the American base hospital there. He had been wounded north of Taejon back in July when the 24th Division was trying to put a few-thousand-man cork in a military bottle 150 miles wide. "I've got a hunch this is only the beginning," the lieutenant said. "Those Communists are going for something more than just this peninsula. Look at those Russian tanks—T-38s, the same that licked Hitler. Their artillery is good, too. Their mortars are murder. His face was lined and thin and older than it should have been. The heat was intense and his leg wound still pained him. The only difference between the lieutenant and the soldiers I had seen up north was that the young officer had a hospital haircut, a shave and clean clothing. He looked reasonably free of fleas. "Don't you think," he asked, "that this is the beginning of World War III?" It is a legitimate question—even more valid now in early 1951 than in the early summer of 1950 when it looked as if the honor of the United States army and the international prestige of the United Nations might be drowned in the Pusan harbor. I don't know what became of the second lieutenant. The magnificent 24th fought and died with heroism matching anything that happened at Bull Run, San Juan Hill, or Omaha Beach. But the lieutenant's question needs an answer. To my mind, the answer is: Yes, Korea is the beginning of World War III. The brilliant landings at Inchon and the cooperative efforts of the American armed forces with the United Nations Allies have won us a victory in Korea. But this is only the first battle in a major international struggle which now is engulfing the Far East and the entire world. Facing us are three enormous problems. The first problem is the world-wide struggle against Soviet Communism, Stalinism, Russian imperialism—whatever you want to call it—that now has the Far East and Europe on the razor's edge. The second problem is the struggle being fomented between the white man and the yellow man. The past history of the white man's conquests and exploitations in the Far East do not make pretty reading. The present difficulties in Asia are not only a challenge to the Western World but also an opportunity. The challenge is to our ideals of individual freedom and democracy. The opportunity is for the United Nations to prove that these spiritual things are not only for the Western Hemisphere but also for the hordes of unhappy, miserable and hungry people of Korea, China, Indochina, India, Siam, Burma and the rest. The third problem is economic. We found, when we went into Korea after the end of the second World War, that, when one Korean meets another Korean on a late afternoon stroll, he does not say, "Good evening," or "How's the little woman?" The formal greeting from one Korean to another is: "Have you had your evening meal? The comment indicates the overwhelming poverty of the Far East. It also partially explains why the Oriental culture of about one-half of the world's population is willing to accept the spurious promises of Communism. The basic appeal is not to their political consciences—it is to their bellies. When we first found ourselves committed in Korea, on July 27th, 1950, the reaction of the baffled officers and the green, badly trained troops was unanimous. "What a place to die!" they said. But they did die—and some are still dying. The weather and fleas and mosquitoes and the rugged hills belied the historic descriptions of Korea—Choson, "The Land of the Morning Calm." Instead, the soldiers, with rough but typical soldiers' irreverence, called it "The Land of the Morning Calm, the Afternoon Attack and the Nightsoil." The main road leading from the former Red capital of Pyongyang through Seoul and Taejon to Taegu has been dubbed "Heartbreak Highway." The graves of those who died along this invasion route testify to the aptness of this name. But "Heartbreak Highway" does not end in Korea. 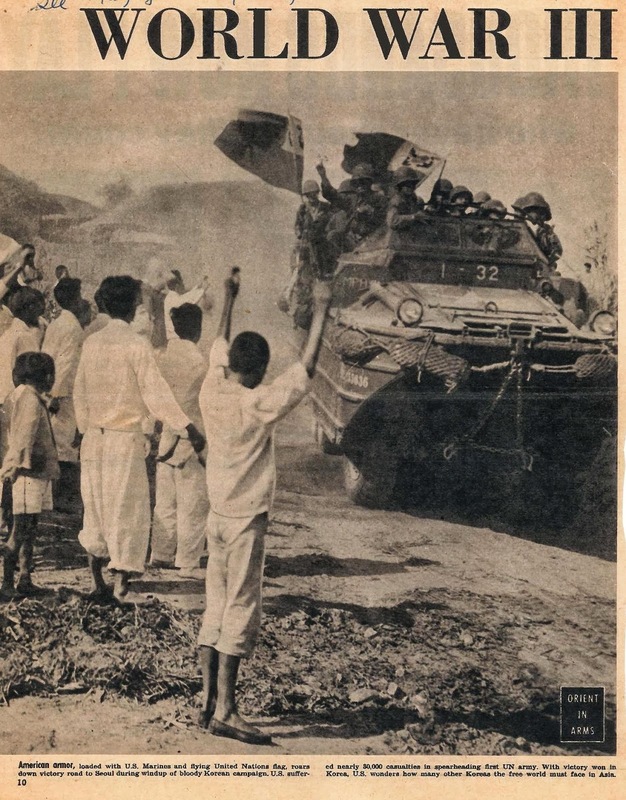 Even now, as we and our allies plan for the reconstruction and relief for thirty million Koreans, Communist-led troops are moving in Indochina and Tibet. They are mysterious names of little-known nations, but their conquest is just as dangerous to the people of America as if an enemy attempted to take Texas. Indochina, fifteen hundred miles south of the Korean Peninsula on the Asiatic mainland, has about the same area as Texas. Its southern capital, Saigon, is an Oriental version of Paris. Its people are more Indonesian than Chinese. As a French colony, Indochina has contributed great wealth to the French nation. The clumsy and often imperialistic policies of the French overseers created a deep-rooted hatred among the Indochinese natives. The West is now reaping the fruits of this hatred. The French also have their "heartbreak highways" along Indochina's northern border with Communist China. A Communist-led army, as big as the North Korean force which struck across the 38th Parallel, has forced the French Foreign Legion to give up many border outposts and cede hundreds of square miles to the revolutionaries. Although the uprising in Indochina is more of a nationalistic movement than a Communist one, Ho Chi Minh, the leader of the rebels, is Moscow-trained and dedicated to Communism. Like the Koreans, his men have great courage and skill in guerrilla fighting. During the past few years, they have been trained and armed by the Chinese Communists under China's Red leader, Mao Tse-Tung. Strategically, Indochina is of great value to any aggressor. It is the gateway to Southeast Asia. It borders on Thailand. Indochina's coast curves around to form a flank on Formosa, considered by General MacArthur as indispensable to America's Pacific defense line. And, most important, Indochina's coast is only 800 miles across the South China Sea to the troubled Philippines. Last October there was another dramatic move in the Far East pattern of Communist aggression—the Chinese Red invasion of Tibet. Tibet is the stumbling block that has separated the two largest nations of the Far East—India and China. The alleged purpose of the invasion was to "liberate three million Tibetans from imperialistic oppression." This is obviously ridiculous since Tiber has been cut off from the outside world for centuries. The Himalaya and Kunlun mountains that make up Tibet are too high and difficult for any extensive traffic. In fact, most of the nation is higher than our highest mountain, Mount Whitney in California. Tibet's people are interested in three things: their flocks, their religion—and being left alone. However, early in 1950, the Chinese Communists advised the government of the 15-year-old Dalai Lama that Tibet—which he theoretically ruled—was to be a territory of the new Chinese People's Republic. This statement vitally interested India, Tibet's neighbor to the south. India agreed to act as a go-between between the governments of Lhasa and Peking. The government of Pandit Nehru has long been attempting to establish itself as the neutral bridge between East and West—the moderator of disputes between nations. India asked the Chinese Communists to "use moderation" in dealing with Tibet. The Peking government had every reason to accede. The Nehru government was carrying the cause of the Chinese Communists in the United Nations, presenting them as peaceful agrarian reformers who deserved to replace Chiang Kai-shek's Nationalists in that organization. India argued that Mao Tse-tung was not interested in aggression, that Chinese Communism differed from Russian. Then, embarrassingly, Chinese Communist troops began the invasion of Tibet. The move was a direct slap in the face of India, and there has since been a significant schism between Peking and New Delhi. India has declared she still will remain neutral in the struggle between East and West. But (as the Irish say) the Tibet incident may determine whom India will be "neutral against" hereafter. For Tibet has borders that touch—and now threaten—India, as well as Burma and Pakistan. America's southern flank in the Southwest Pacific is the Philippines. When we granted them independence on July 4, 1946, the effect was felt throughout the Far East. During the past five years, Washington has assisted them to the tune of more than two billion dollars in cash and materials. At first there were signs of post-war reconstruction and order in government. Then there were signs of decay. Great swindles occurred in the US war surplus material left in the islands. Election frauds and corruption in office became common. Production lagged. Finally, President Quirino asked the US to investigate. It did. Experts, headed by former under-Secretary of the Treasury Daniel Bell, exposed Philippine inefficiency and corruption. President Truman offered Manila another quarter of a billion dollars—but only on condition there be sweeping reforms. Quirino has been having serious trouble with peasant revolutionaries called the Huks (short for Hukbalahaps). Their leadership is Communistic but the growing support they are getting in rural areas can be traced to government indifference and corruption. The fundamental answer to the question of all-out war in the Orient now lies with the Communist regime of Mao Tse-tung in China. His 475 million subjects represent the biggest manpower reserve in the world. There has been one encouraging development in the Far East, however. The recent armistice in the revolution in Indonesia, the islands to the south of Indochina, was one of the United Nations' first victories. A UN commission succeeded in stopping the bloodshed in Indonesia and forcing negotiation between the revolutionaries and the ruling Netherlands government. The upshot was the newly-born United States of Indonesia and a measure of independence viewed enviously by other peoples of the Far East. Whether we like it or not, the USA has an inferential responsibility to the Indonesian government. When I first went to Batavia, shortly after the end of World War II, everywhere, painted on public buildings and on streetcars, were slogans reading: "All men are created equal," "Government of the people, by the people and for the people. There were other quotations from American history. Significantly, all the signs were printed in English. World War III, which appears to have had its beginnings in the Far East, will not be won by force of arms alone. At present the Communists are doing much better than the Democracies in the ideological struggle. The young Chinese under Mao are dedicated men. There are those in Washington who argue that the hold of the Chinese Communist is unbreakable, but that Oriental Communism is a different brand than the Kremlin's. The school of thought urges that we try to convince Mao of the United Nations' good intentions—in other words, attempt to make him a Far Eastern Tito. Opponents charge that such a move would be craven appeasement. Whatever the right answer, clearly we have many tasks before us in the Far East if the battles such as those fought in Korea and Indochina are to be kept under control. First, the United Nations must be militarily strong. The American plan, adopted by the General Assembly of the UN, which provides a standing international police force to meet aggression wherever it occurs, is the first positive step towards preventing other "Koreas." Secondly, as soon as possible in the Far East, the UN should attempt to ditch last-century imperialism inherited from the exploiting colonists. Finally, the ideals of personal freedom and individual justice must be "sold" to the people of the Far East. But this is only the beginning of the job in the Orient. The easiest and best way of winning the East is with a full bowl of rice. Democracy, after all, is one philosophy that must be practiced with a full stomach. 1945. Downs to Parachute into Berlin? 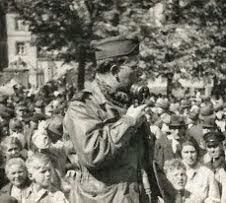 Bill Downs did not end up having to join the paratroopers when the time approached. Stalin's distrust of the Western Allies led to the Soviet occupation of the city. 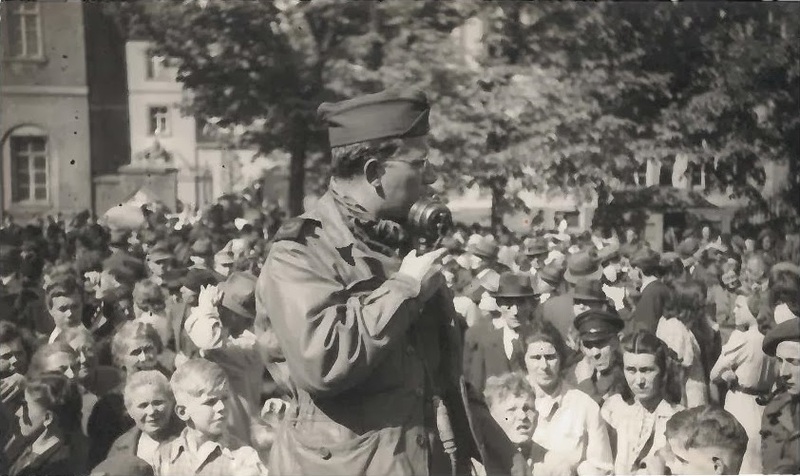 If present plans come to pass, the first U.S. radio correspondent to reach Berlin will be a CBS newscaster, who will float down into the invaded city by parachute. At SHAEF's suggestion, correspondents of the four big networks have drawn lots for this coveted and perilous privilege. CBS officials last week admitted that they had won the lot-drawing, and said that any one of several well-known CBS men might actually make the jump. But the Office of Censorship passed a story [PDF, March 19] in the radio trade magazine, Broadcasting, definitely naming one man as the lucky jumper. He was William Randall Downs Jr., 30, currently shuttling between the western front and Paris. Downs is no acrobatic super-scoopster of radio journalism (he has never jumped from a plane), but a quiet, grey-eyed, bespectacled graduate of the University of Kansas. He used to be a United Press reporter, joined CBS's London staff in 1942, reported by microphone from Moscow the following year. Since D-Day, he has spent most of his time plodding along with the land forces in western Europe, and is now assigned to the Twenty-First Army Group. The plan is for CBS's jumper to leap from a bomber during the first phase of the entry into Berlin, before any other newscasters are allowed to land by plane. He will broadcast from a German station if one is still in operation; if not, probably from a 60,000 watt mobile transmitter which the Army packs on 17 trucks. All U.S. networks will carry his historic broadcast. "The statement does not reflect the good judgment and good will with which MacArthur has been governing Japan. 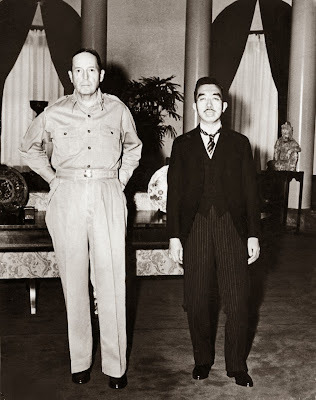 "But MacArthur made his statement before Secretary of State Byrnes had assured the world that the Far Eastern Commission would not obstruct MacArthur in the outstanding and efficient administration of Japan," the reporter continued. "Thus it was unfortunate. But perhaps it was not entirely his own fault. "I left Japan a few weeks ago. The men on MacArthur's staff are anything but liberal. They fear Russia; as a matter of fact, they regard Japan as America's Western frontier. MacArthur is not entirely unsympathetic to their views. "Consequently, based on military reasoning -- and these are military men -- they see any arrangement which might obstruct their government of Japan as a weakening of the position of the USA in the Far East. "From my knowledge of the men who are now running conquered Japan, the only thing they really fear is Russia. Our economic directives to Japan make no provision for the possibility that perhaps the Japanese people may want a Socialist government. There would be widespread fainting in MacArthur's Tokyo headquarters if the coming Japanese elections turned out that way. "And this distrust of Russia in the Far East has been fostered by the Soviet Union itself. In Korea, the Russians have absolutely failed to meet any of our requests for cooperation. They shot down a B-29 in Korea shortly after the surrender of the Japanese in that country, and no one can mistake a B-29. Also the Russians have refused to cooperated in the exchange of vital fuel and food...we had the food, the Russians had the coal. 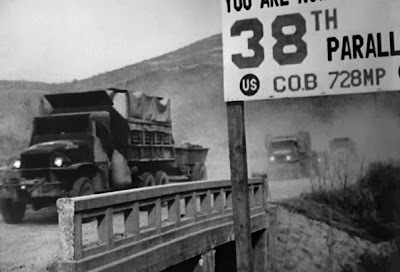 But the 38th parallel (dividing Soviet and US zones) was a hermetically sealed, artificial border made airtight by the Russians. "The atmosphere of suspicion created by anti-Soviet members of MacArthur's staff and the more intensified suspicion created by Soviet commanders in the Far East is perhaps the major obstacle to the purposes of the United Nations in that part of the world. "The American people know that we have no imperialist designs on the Japanese islands, but apparently the men who are governing Japan are not so sure what our designs may be." More than one million Germans on Field Marshal (Sir Bernard L.) Montgomery's Twenty-first Army Group front surrendered on this historic May 4, bringing hostilities to an end for the Canadian Army fighting in Holland and the British Second Army fighting in northern Germany. (Other dispatches and previous estimates set the figure of troops involved at well over 500,000, but not more than 600,000.) It was the biggest mass surrender of German forces since the Armistice of 1918 (provided the higher figure is correct). A German surrender mission headed by Admiral von Friedeburg, Commander in Chief of the German Navy, signed articles of unconditional surrender for the German land, sea and air forces facing the Canadian First Army and the British Second Army at 6:25 o'clock this evening. Field Marshal Montgomery signed in behalf of the Allied Supreme Commander in Chief, General (Dwight D.) Eisenhower. The signing occurred in a tent set up especially for the ceremony in front of Marshal Montgomery's headquarters on the Lüneburg Heath just south of Hamburg. It's significant that the northern German armies were surrendered on this barren, artificially forested heath, which for years has served as the training ground and birthplace for German armies. It was here that technically a large part of the Wehrmacht died. For this northern European front, it means that the fighting for the Canadian and British armies here is virtually finished. The only European nation in northern Europe yet to be liberated is Norway. There still is the Dunkerque pocket, but these events must have a tremendous effect on the Germans still holding out there. It was a great moment, a historic moment, there in the cold rain, the blustering winds on the Lüneburg Heath, in the heart of northern Germany, a great moment not only for Britain and Canada but for the American Eighty-second Airborne Division, the American Eighth Infantry Division and the American Seventh Armored Division, fighting under the Second Army in its hour of victory. It was also a great moment for America and Russia and France and the world. Here is the background of the historic signing of the biggest mass surrender of German forces since the armistice of 1918. The stage was set for the big surrender in the north when the British Sixth Airborne Division, operating under the American Eighteenth Airborne Corps, drove northward to the Cleve-Elbe River bridgehead south of Hamburg to reach the Baltic Sea at the city of Wismar. This happened Wednesday night. Then the British paratroopers linked up with the Russians. Coming up on the right flank, the American Eighth Infantry Division and the American Eighty-second Airborne Division made linkups to the south of Wismar on Thursday, the next day, with the Russian Army. What happened was that this drive to the Baltic carried the Second Army thrust directly behind the line of retreat of the Germany Army Group, the Nazi armies retreating before the drive in the north by General (Konstantin K.) Rokossovsky's forces advancing westward. In the first three days it is estimated that more than half a million prisoners were taken, mostly from this army group retreating westward. That explains the large number of staff officers who fell into British hands during these fateful days. We were capturing the generals before encountering their fighting troops. The rout had set in for the German armies on the northern front. On Wednesday, May 2, a German general who said he commanded the so-called army group, hoisted a white flag and sent an emissary to the headquarters of the British Second Army. He said he commanded all the forces between the Baltic and the Weser River, the river running southward from Bremen. He said he wanted to surrender this army group. General (Sir Miles C.) Dempsey, commander of the Second Army, replied that he should start moving, and a rendezvous was arranged for Thursday. The German general did not appear, but he sent word that negotiations were going on a much higher level than his military station. He could not negotiate. It was yesterday that a party of four higher German officials again hoisted a white flag and drove into the British lines. The head of the party was Admiral von Friedeburg, commander in Chief of the German Navy who replaced Admiral (Karl) Dönitz while the latter assumed the title of Führer. Von Friedeburg's rank also carries the title of General of the Army; thus, he was able to negotiate for the ground forces as well. With von Friedeburg was General Kinzel, the next ranking officer, who is chief of staff to Field Marshal (General Ernst) Busch, who is commander of the northern German armies. Field Marshal Busch, incidentally, is still missing from our prisoners' list, but we should catch up with him soon. And next came Rear Admiral Wagner, a staff officer to Von Friedeburg, and lastly, a Major Friede, a staff officer to General Kinzel. This was the party who hoped to negotiate with Field Marshal Montgomery. They were taken to "Monty's" field headquarters on the Lüneburg Heath. He stepped out, returned their military, not Nazi, salute and asked, as if they were vacuum cleaner salesman, "What do you want?" "We come from Field Marshal Busch to ask you to accept the surrender of three German armies which now are withdrawing in front of the Russians in the Mecklenberg area." These armies, it was later revealed, were the Third Panzer Army, the German Twelfth Army, and the Twenty-first Army. The Nazi officers continued: "We are very anxious about the condition of German civilians who are fleeing as the German armies retreat in the path of the Russian advance. We want you to accept the surrender of these three armies." To his everlasting credit, Field Marshal Montgomery turned down three German armies willing to surrender to him. "No," he said. "Certainly not. Those German armies are fighting the Russians. Therefore if they surrender to anyone, it must be to the forces of the Soviet Union. They have nothing to do with me. I have nothing to do with the happenings on my eastern front. You go surrender to the Soviet commander. The subject is closed." Then Field Marshal Montgomery asked: "Are you prepared to surrender the German forces on my northern and western flanks? Those forces between Lübeck and Holland and the forces in support of them, such as those in Denmark?" The Germans said no, but they added that again they were anxious about the conditions of the German civilians on the northern flank. "We would like to come to some agreement with you by which the civilians would be saved from battle slaughter," they said. Then the German commander proposed a complicated and difficult military program covering the next few weeks, in which the British Second Army would advance slowly while at the same time the German troops, by agreement, would retreat slowly. It would work well for the Germans. Again Monty said: "No, I will not discuss what I propose to do in the future—nothing." Then the British Field Marshal took the offensive. "I wonder," he said, "whether you know the battle situation on the Western Front." And he produced his operational map; the war was too close to being won for it to have any security importance. This map, and what he said, were the final straw, the one factor which precipitated the surrender of 1,000,000 Germans. The German commanders were shocked, astounded by the progress of the Allies in the east and the west. It was lunchtime and they went off to lunch alone. Admiral von Friedeburg burst into tears when he got out of sight of Montgomery, and he wept throughout lunch. After lunch, Field Marshal Montgomery called the Germans back for further consultation, and there he delivered his ultimatum, an ultimatum that must have hurt the Nazis as much as the landing in Normandy. "You must understand three things: Firstly, you must surrender to me unconditionally all the German forces in Holland, Friesen and the Frisian Islands and Helgoland and all other islands in Schleswig-Holstein and in Denmark. "Secondly, when you have done that, I am prepared to discuss with you the implications of your surrender: how we will dispose of those surrendered troops, how we will occupy the surrendered territory, how we will deal with the civilians, and so forth. "And my third point: If you do not agree to Point 1, the surrender, then I will go on with the war and I will be delighted to do so." Monty added, as an after-thought, "All your soldiers and civilians may be killed." One, two, three, finished. This shook them. They said that they came entirely to ask for the acceptance of three armies who wanted to surrender. They said they had no authority to agree to Monty's demand. But they agreed that two of them would remain behind while the others presented the new terms of surrender to their superior. So at 4 P.M. yesterday afternoon, Admiral von Friedeburg and Major Friede went back with the news. They returned today at about 5 o'clock in the afternoon with the complete acceptance of the unconditional surrender terms, and that's how surrenders are made. And this is what it looked like, the signing of a great surrender of the German forces in the north to the British and Canadian armies. It was raining when we arrived at Monty's headquarters, set in the shrubbed pines and firs of the Lüneburg Heath. The weather was more like fall than spring, with the winds of the North Sea whipping a cold drizzle over the whole landscape. But overhead, weather or not, the Spitfires and Typhoons roared over, heading always northward, where Germans were reported trying to escape to Norway, Sweden and Denmark. The air forces were continuing the attack until the last minutes of surrender, a sign of Allied strength built up in Germany. We were led to a tent, a weather-beaten tent that had been pitched scores of times at the Field Marshal's headquarters. It wasn't large, about ten feet wide and twenty feet long. Family size. Inside was set up an ordinary kitchen-size table. On top of it was a blue cloth. Between two microphones was an inkstand with an ordinary steel-tipped pen lying on top. The German mission arrived and walked to the front of Monty's caravan. Admiral von Friedeburg was invited inside for a last-minute conference. At this time it was not completely settled whether the German answer to the unconditional terms would be yes or no. An extra person had arrived with the Admiral's party, a Colonel Paulik, once a member of the staff of Field Marshal (General Wilhelm) Keitel; Keitel is second in command of the German armed forces only to Führer Dönitz. The party had plenty of weight, but did not officially bear Keitel's authority. And while Monty and the Admiral were meeting in the caravan, the other Nazi bigwigs stood in the rain, cold and shivering, just like us reporters. Then they marched down the gravel path toward the tent. There was Admiral von Friedeburg dressed in a gray leather coat, German Navy style, with a battered hat on his head. But the striking thing was his face, the pushed-in German face, deeply lined and absolutely gray and motionless. His was the responsibility in the surrender mission, and he showed the strain of his duty. Frankly the Admiral, who wept so copiously at lunch the day before, today looked as if he had been crying ever since. But the most magnificent figure was General Kinzel, the chief of staff for the German armies in the north. He was the perfect figure of what the world has come to know its sorrow as the German military peacock, complete with monocle. General Kinzel wore a light green, fastidious German Army greatcoat, with brilliant red lapels. His monocle seemed to glisten even in the dull gray of the afternoon. If his face had not been set in concrete, you might have expected him to burst into song for a Viennese operetta. He was that beautiful. The small fry, the colonels and majors and all the rest of the surrender party, were gray ducks by comparison. He carried the surrender papers in his right hand. The moment he appeared the Germans snapped to attention, like puppets. The British Field Marshal sat down and stretched out his hand in invitation for the Nazis to do the same. The cameras began to whirl and click, and Monty picked up the historic document that meant the surrender of more than 1,000,000 Germans. He put up his horn-rimmed spectacles, picked up the papers and said, "I will now read the terms of the surrender." The Germans sat like statues, not a flicker of emotion on their faces. Solemnly, but with a note of triumph in his voice, Monty read the terms of surrender. You could tell that this was the moment for which he had been waiting in Alamein, in Tunis and in Italy. Then, one by one, the Germans signed. Admiral von Friedeberg, General Kinzel, Rear Admiral Wagner, staff officer to von Friedeberg; General Paulik and Major Freiberger. They didn't say a word or betray a single emotion; it was strictly Prussian ceremony for the Germans. Then the Field Marshal took up the wooden pen with the steel tip. "And now," he said, "I will sign on behalf of the Supreme Allied Commander, General Eisenhower." The ceremony took about five minutes. This August 18, 1970 interview took place eleven days after the ceasefire between Israel and Egypt over the War of Attrition that began after the decisive Six-Day War. In this segment Yitzhak Rabin expresses to Downs Israel's concerns about Egypt's trustworthiness. John Scali also reports.